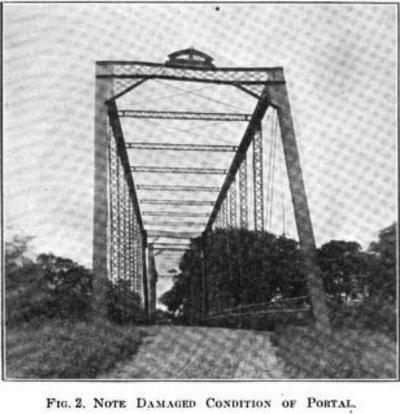 Bridge damaged by tornado in 1916. Public domain. 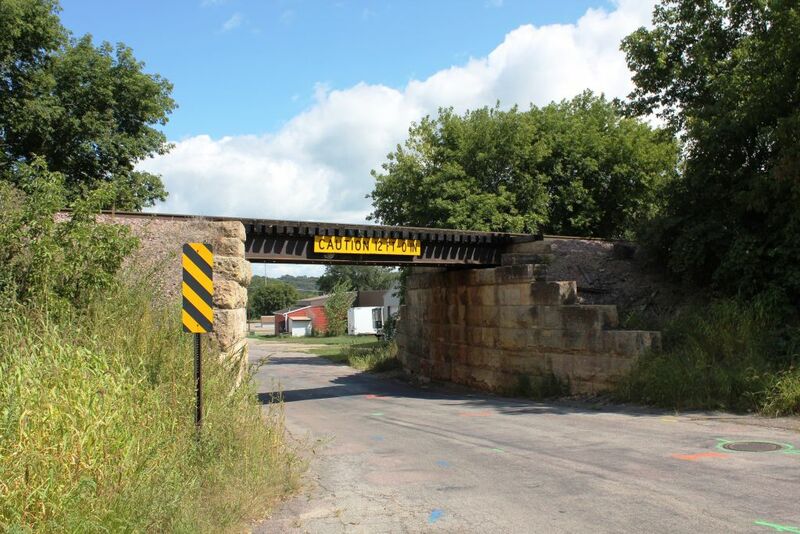 Our next mystery bridge takes us to Kankakee County, Illinois and to Sugar Island. There, a fellow pontist brought this bridge to the author’s attention. Little information regarding the crossing can be found, photos included. We do know that the bridge is located 10 miles south of Kankakee and 20 miles south of the interchange between I 80 and I 57 near Chicago. The current structure spans the Iroquois River on a county road, east of US Hwy. 52 (click here for more information on its location and information). It replaced a multiple-span through truss bridge around 1979 although there was no information on its aesthetical appearance, let alone the bridge builder. 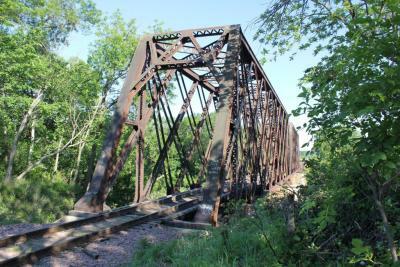 That bridge replaced a two-span Pratt through truss bridge, seen in the picture above. That happened around 1916 after a tornado damaged half of the span, causing it to lean over. More photos of the damage can be found here. What is unique about the first bridge at Sugar Island is the builder’s plaque that were located on each end of the crossing. Here is where a debate is most likely to be brought up until further research is needed to prove one or the other. On one hand, the plaque looks like one that was used by the Continental Bridge Company in Chicago. The bridge company was located in the Monadnock Building and was in service between 1903 and 1907, with another bridge company located outside the city in Peotone from 1906 to 1931. Yet it is unclear whether the company moved to Chicago from Pennsylvania (where another CBC existed in the 1870s) or was simply shut down and reestablished. A report written by the author in 2005 provides some information on the company’s history and the possible relationship between the Chicago and Pennsylvania firms. 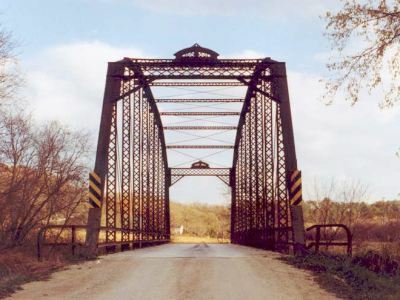 A fine example of a CBC product is the Chimney Rock Bridge in Winneshiek County, Iowa. According to the plaque, the bridge was built in 1906 but was relocated to its present site in 1952. Research is still needed to find the origin of the bridge- where it was located prior to its relocation. Looking at the portals more closely, one can see the bridge builder and the year it was constructed. 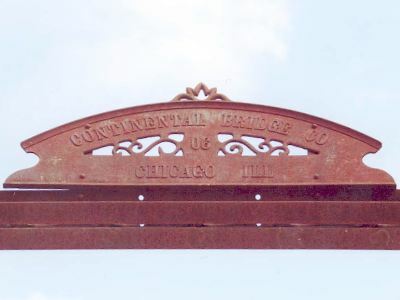 Yet by the same token, some people claim that the plaque similar to CBC can be found on some of the bridges built by the Massillon Bridge Company in Ohio, thus creating the argument that the Sugar Island Bridge may have been built by that company. What would be objected is that only a handful of bridges were reported to have carried this plaque before they were replaced. 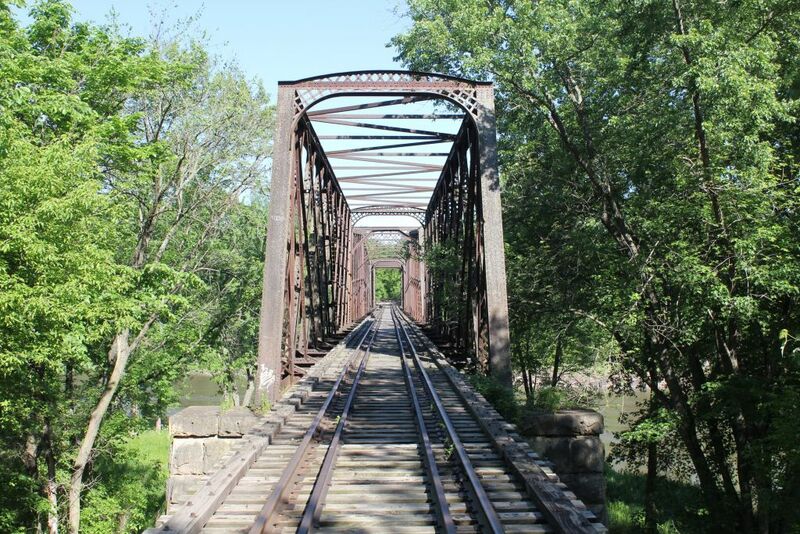 This included the Kilmore Creek Bridge in Clinton County, Indiana, which existed from 1885 until its demise in 1991. In addition, the portal bracings of most Massilon bridges feature an arched Howe lattice portal bracing and not those of CBC, which are Town Lattice with heel bracings, like the aforementioned examples. Furthermore, many counties inside Illinois looked in-state for bridge builders that can assemble a crossing together at a price cheaper than the giant companies, like the American Bridge Company, King Bridge Company and even the companies in Pennsylvania and Minnesota. The cost included the fabrication of steel bridge parts and transporting them to the site for assembly. While Chicago, Springfield and Joliet became main bridge building hubs, serving as competitors to the giants, the most popular was the Illinois Steel Company, which built bridges well into the 1980s. Therefore, it would make sense to buy locally resulting in the ability of these companies to survive on their own. Located along the Danube River, the city of Ulm, with a population of over 123,000 is one of the oldest cities in Germany. First mentioned in 850, the city had straddled the river for almost a millenium, making it one of the key points of trade and commerce. It had once been declared an Imperial City by order of Friedrich Barbarossa in 1181. However, thanks to Napoleon’s conquest in 1805, Ulm was parted along the river, making it part of Baden-Wurttemberg, whereas the settlement east of the Danube was declared Bavarian and renamed Neu-Ulm. The names have remained the same ever since, although both cities are deeply engaged in joint ventures on the public and private scales, and are sister cities of New Ulm in Minnesota (USA). Some of the key characteristics Ulm has to offer include a professional basketball team “ratiopharm Ulm,” The Ulm Minster Cathedral with the world’s highest steeple surrounded by historic buildings and a large market square, the historic city hall, a pyramid-shaped modern public library, one of the largest collection of “Fachwerk” houses dating back to the Medieval Era (many located along the canals streaming through the southern part of the old town, and memorials honoring scientist Albert Einstein as well as Hans and Sophie Scholl, leaders of the White Rose movement that propagandized against the regime of Adolf Hitler. And then there are the bridges that are worth mentioning. While all of the Danube crossings in Ulm/Neu Ulm were destroyed towards the end of World War II, a large portion of the pre-1945 bridges were spared destruction and subsequentially repaired to make them functional again. Whether it is the Neutor Bridge or the stone arch bridges along the Blau Canal, or even the rebuilt Herd Bridge, Ulm today still has a wide array of bridges that fit the cityscape, some of which conform to the Renaissance period landscape in a way that a person is actually walking back into time to get a glimpse of Ulm’s past. This tour takes you to the most noteworthy bridges in Ulm one should visit while visiting the city. The goal is to provide you with a glimpse at the role of the bridges in the city’s development and their survival through two World Wars. While there are over five crossings over the Danube River, the Herd Bridge will be profiled here because of its historic significance despite being rebuilt after World War II. The other bridges were built in the 1960s on and do not have the historic taste in comparison with the bridges mentioned here. For some of the other bridges profiled here, information is missing on their history- in particular, the bridge builder and the year of construction. If you wish to add some information about these bridges, please contact Jason Smith at the Chronicles, and that information will be added. A map of the bridges’ and their location are found here and the bridges…. Location: Danube River (main channel) at Donaustrasse (Ulm) and Marienstrasse (Neu Ulm). This bridge is one of two crossings that carry a single street over both channels of the Danube River. Ironically, the Gänsetorrücke in Neu Ulm, despite spanning the narrower channel of the river is longer than this bridge by about 21 meters. This bridge features a single span elliptical arch design wide and tall enough to accomodate boat traffic along the river. 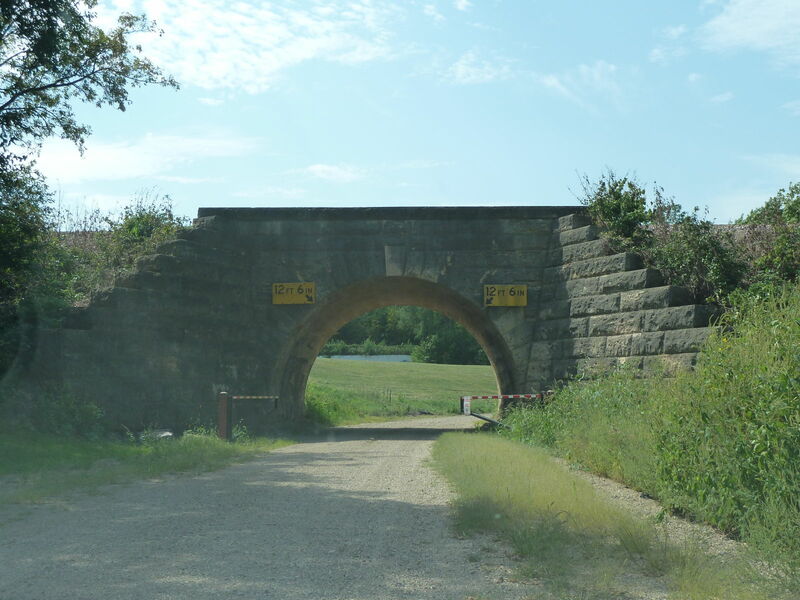 Built in 1949, its predecessor was a three-span brick arch bridge built in 1832 and named after Ludwig Wilhelm. Unfortunately in an attempt to slow the advancement of American and British troops from the west, the Nazis imploded the bridge in April 1945, a month before Germany capitulated in Berlin and Flensburg, respectively (please click on this link for more information on this topic). A temporary bridge was erected, which remained in service until this bridge was built. Today, this bridge serves as the key link between the city centers of Ulm and Neu Ulm, while at the same time, its historic significance fits in nicely with the surroundings of both cities: a 1949 bridge whose modernity fits the cityscape of Neu Ulm but its arch design fits nicely with the old town of Ulm itself. A nice compromise for a crossing like this one. The Neutor Bridge is the most ornamental of the bridges in Ulm. At over 120 meters long, the bridge’s main features are the towers, whose finials are covered with gold egg-like figures. The towers portals features the city’s shield with its black and white color. When taken from Kienlesbergstrasse, you can capture the bridge and the cathedral all in one, as long as the weather is cooperative. While designed by Levi and Büttner, the construction of the bridge was done by the firm Maschinenbauwerk in Esslingen, a very popular steel fabricator of bridges and train locomotives until the late 1960s. The company was founded by Emil Kessler in 1846 and was solely responsible for the construction of railroad bridges, railroad tracks and train locomotives and coaches. Apart from this bridge, the company was responsible of the building of the Unterreichenbach Railroad Bridge in 1874 (today, the only example of a Schwedler truss bridge left), The Neckar River Steel Arch Bridge at Plochingen in 1949, and The Fehmarn Bridge in 1963. The company survived several takeovers and concourses during its 120+ year history before the company announced its cessation of production in 1966. Shortly thereafter, it was bought by Daimler-Benz. Despite being used regularly and its thoroughly done maintenance, the bridge will receive another crossing only 200 meters to the west, which will provide a more direct connection between the city center and train station to the southwest as well as the freeway Highway 10 to the west. While the design has been announced, construction has not started yet as of present. It does appear though that the bridge will be left in place as a secondary crossing going to the northeast once the new crossing is open by 2020. The Ludwig Erhard Bridge is the first bridge you will see when disembarking the train at the railway station. In the daytime, one can see the blue and grey colors of the tower and cables as it decorates the hillside in the background. At night, however, the colors change to yellow, for the towers are lit by sodium street lamps lining up the meridian and the inner portions of the towers, thus making photography an interesting adventure. The bridge replaces the Blaubeurer Bridge, a steel girder bridge from the 1950s that had corroded away thanks to the black smoke from the trains combined with heavy traffic. Yet this combination steel and concrete bridge improves a key link along Karlstrasse between the city center, Neutorbrücke, the railway station and the eastern suburbs on one end, and the freeway Highway 10 and parks to the west. All of the mentioned locations are centralized and easily accessible even by foot. The Bleicher Hag Bridge is the longest of the bedstead truss bridges that exist along the railroad lines serving Ulm, with five spans of 120 meters, totalling 600 meters. There is little information about the construction date of the bridge, let alone the bridge builder, yet given the popularity of the riveted truss bridges after the turn of the century and the effects of World War I, a date of 1920 best made sense to pinpoint. The caveat with this bridge is its narrowness- only 3 meters wide and with a weight limit of six tons. But given the increasing demand of rail traffic and the improvement of vehicular traffic, chances are likely that this bridge may be replaced with a larger, more appealing structure in the next 10-15 years. But it depends on the availability of money and manpower to make it happen. Location: Railroad line at Y-junction of Ulm-Treuchtingen-Nuremberg Line and Munich-Ulm-Stuttgart Line, north of Ulm Hauptbahnhof. This bridge is hard to find, unless one wishes to walk across the Highway 10 bridge on the north side. Here is where one can get the best photo. The bridge is unique because of its curved spans as it crosses the rail lines going east past Ulm. Most likely this bridge is used for freight traffic not wishing to stop at Ulm Railway Station, located only 500 meters to the south. Like the Bleicher Hag Bridge, the Lehrertal Bridge has little information on its history but it appears that the bridge has been in service for 60+ years, namely because of its welded connections that had started becoming popular at that time. Yet more information is needed to confirm this. Das Schiefe Haus with the bridge in the background. 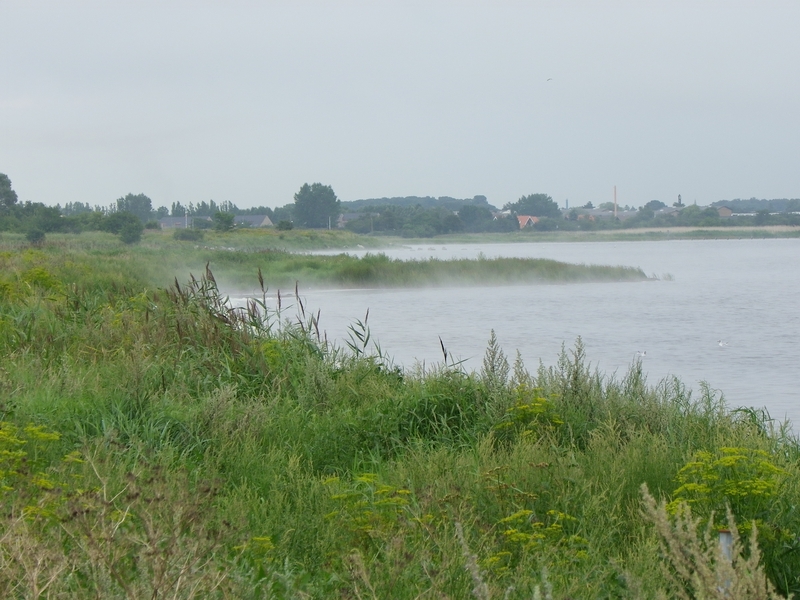 Located at the north tip of the island surrounded by the Blau Canal, this bridge is the lesser visible of the brick arch crossings because of the Fachwerkhäuser and vegetation interfering with the view. Nevertheless, the bridge fits nicely in the cityscape, providing access to some of the small shops in the Old Town. It is located behind one of the recently restored Fachwerk houses (the light brown colored one as seen in the picture) where a gallery and private residence occupies it. The bridge dates back to the 1700s but unlike the one at Schiefeshaus, this one carries automobile traffic but at a snail’s pace because of the high number of people soaking in the scenery of Ulm’s Old Town. EN: Long live freedom, history and heritage. Author’s Note: This article is part of a series being done on the cities of Ulm/ Neu Ulm, Germany and the city of New Ulm written by sister column, The Flensburg Files. For more on this topic, click here more details. The story behind Hans and Sophie Scholl can also be found there as well. 2015 marks a special year for the Bridgehunter’s Chronicles. Five years ago this month, together with sister column The Flensburg Files, the Chronicles was launched on the areavoices platform, operated by the Fargo-based InForum Communications. Over the years, the online column has expanded, winning support from hundreds of readers, preservationists and bridge-lovers alike, including those seeking help to preserve their beloved treasures of their communities. Again for the fifth time this year, the Chronicles is now collecting entries for the 2015 Ammann Awards. The Awards goes out to people who devoted their efforts into saving historic bridges, as well as historic bridges that are worth seeing, not just from the author’s point of view but also that of others. Between now and December 1st, you can submit photos for Best Photo, mystery bridges for its own award as well as that for best preserved bridges, cities/regions with a high concentration of historic bridges for the Best Tour Guide, and people for Lifetime Achievement. More information you can find in the front header of the column or by clicking here. It includes the winners of the Awards in the previous years dating back to 2011. Entries are due by December 1st, 2015 at 12:00am Central Standard Time (or December 2nd at 7:00am Berlin Time). Voting will then proceed from there, which will be done directly through the Chronicles’ polling page. This was introduced as part of the launch of the Chroncles’ wordpress website page, earlier this year. More instructions to come once the entries are collected. In addition to the traditional voting, voting will also take place to determine the top five places to visit historic and unique bridges as well as the top five bridges to visit, both on a national and international scale. This is in connection with the Chronicles’ fifth anniversary and it includes not only the bridges and places profiled here to date, but also those you have contributed. If you want to contribute to this part, please let Jason Smith at the Chronicles know. The e-mail address can be found in the header About the Bridgehunter’s Chronicles. Side view of the Jackson Street Bridge. How did you guys collect that much money for the project? What events did you have apart from the marathon and the introduction of the brew? No marathon; not sure where that came from. Oh, I bet that’s a reference to the Mayor’s Annual Ride for Trails, an annual April event sponsored by Des Moines Parks and Recreation to support the city’s trail network. This year, the net ($12,500) went toward the bridge project. Tapping of the golden keg for Bridge Builder Pale Ale (Oct. 8) was our only other public event. We hoped 100 people would attend; we ended up with nearly 400. A measure of success: attendees drained the ATM machine, which had to be replenished. Des Moines looks best when public and private groups come together to support a project. And we had it great outpouring of success. The bridge is part of the Meredith Trail; the Meredith Foundation was extremely generous and made an initial in-kind contribution for a $100,000 engineering study of the bridge rehabilitation. 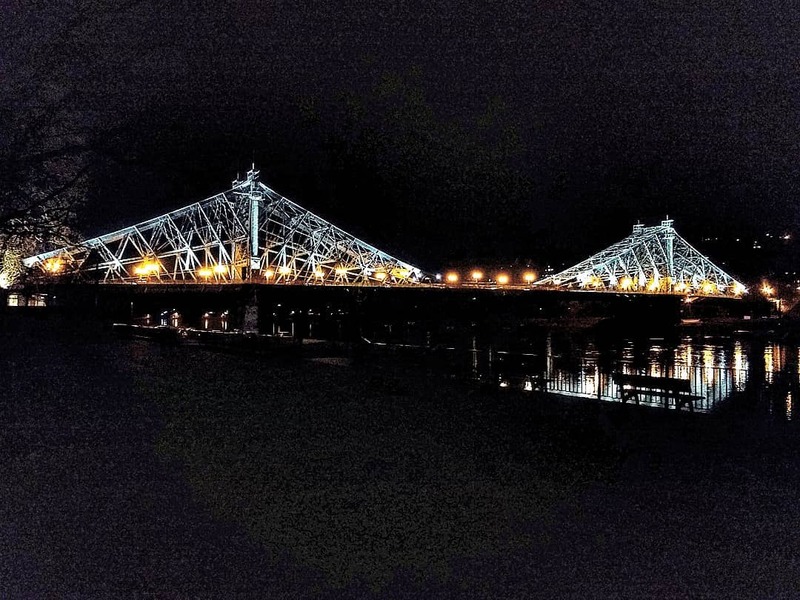 The City of Des Moines Engineering Department accepted the study by Genesis Structures of Kansas City and used that study a basis to assemble the bridge package. The Meredith Foundation donated an additional $200,000 toward the bridge ($300,000 total). Other contributions ranged from $20 to $200,000. Included in this: family foundations, corporations, the Downtown Neighborhood Association, Capital Striders Running Club, The Society of Italian-Americans Auxiliary, and the Knights of Columbus. We tried to cover all bases! Yes, we were extremely fortunate. Only one downtown business said no. Incredible. Who all donated for the project as far as businesses were concerned? Nearly every downtown developer made a significant contribution to this project. Because the funds are held by the Community Foundation of Greater Des Moines, there are benefits individuals, foundations, and business contribution as either nonprofit contributions or marketing expenses. Through an agreement with the City of Des Moines, we also accepted three-year pledges; nice for foundations. What difficulties did you have in the efforts? My recollection is that once the $500,000 state grant for recreational trails was secured (required a $500,000) match, we felt the task was doable. With the Younkers, Methodist Hospital and YMCA meeting their untimely end, was there a point where you were afraid that the Green Bridge would also meet its fate? The change was instituted from the ground up by a small group. Personally, I always felt our volunteer committee was up to the task. It was a fabulous volunteer committee with plenty of community connections. We did this on our own without a professional fund-raiser or marketing professional. We had a tight timeframe: Raise the funds by the end of August so the bid package could be assembled and bids approved in the December 2015 to January 2016 timeframe. We met our goal. What exactly is next with the bridge project? What is the time frame we’re looking at between now and the time the bridge reopens? The bridge packet for potential bidders is being assembled now. Dec. 21: approve contract (assuming a qualified bidder comes in under $3.2 million). Rehabilitation will begin with the spring construction season (March-April), which helps contain costs (completed in one season). One of the necessary expenses is tenting the bridge to remove lead-based paint. 6.What more is needed for the project? What can a person do to help? We have raised the $2.3 million targeted for the rehabilitation of the bridge. Donor plazas. We are now seeking additional dollars for donor plazas (one on each river bank). 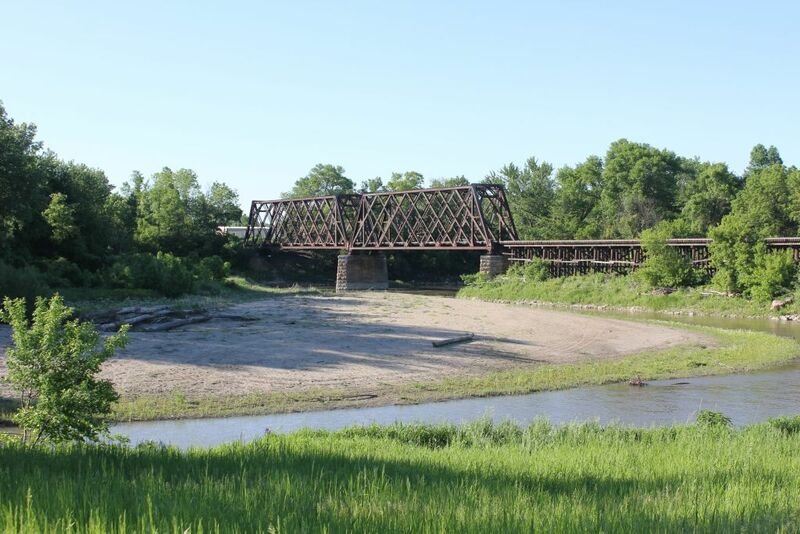 We already have a $50,000 in-kind gift to tell the story of the bridge construction and the south side Des Moines neighborhood that the 1898 bridge connected. The bridge opened up downtown Des Moines jobs and retail to the vibrant south side neighborhoods, known primarily as an Italian immigrant neighborhood. Many of the descendents of those original Italian families have prospered in Des Moines and served as public officials, business leaders, and restaurateurs. LED lights. We are working with a local lighting expert who is really jazzed about adding LED lights to this bridge, which will be opened 24/7 to walkers, runners, and bicyclists. As you might expect, the LED lighting bundle is not part of the basic rehabilitation, so this will be an additional expense. If a person is interested in the bridge brew, how can it be ordered/bought? In all, 640 gallons were brewed for this event. Bridge Builder Pale Ale is available at the Confluence Brewery, several local bars and restaurants, and many Hy-Vee grocery stores. Bridge Builder is available in ½ growlers (1 quart) for $10 in the grocery stores. The brewery created a really nice silk-screen design for the pint glasses and ½ growlers. Looking at the article released by the Chronicles, there was a nice quote with an analogy to a song by ELO with “Don’t bring me down!” What’s your take on this trend? I think I can speak for most committee members: We were committed to saving this bridge. Dang, it’s a part of the downtown fabric and was such an important to link the south side to downtown Des Moines. Great stories have arisen from people who remember walking across the bridge to go to a downtown movie. Or terrified teenage boys and girls driving across the rumbling timbers for the first time when it was still opened to auto traffic. I think we were happily stunned when so many like-minded people stepped up to contribute—local history buffs, bridge fans, walkers, runners, cyclists, downtown developers, and downtown residents. This project caught the attention of the pubic and the media. 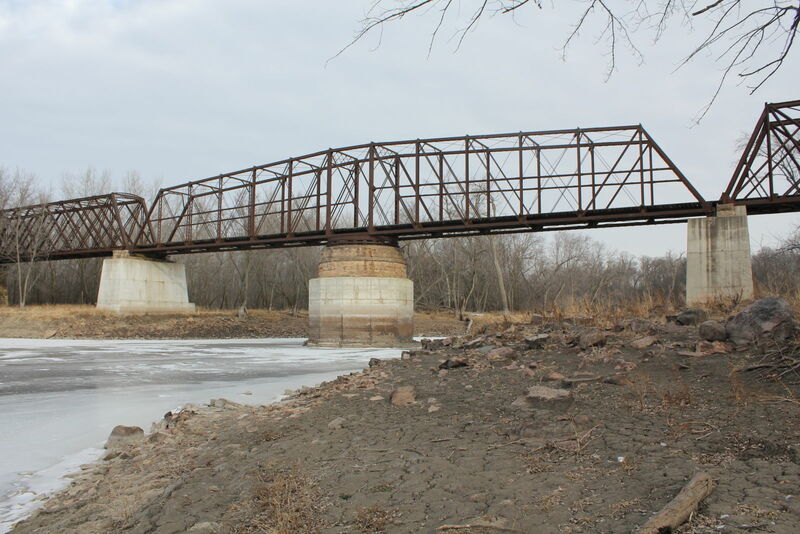 We’re so pleased to save this bridge that’s on the National Historic Register of Places. Some people call it the Green Bridge, the current color, even though it’s been dark brown/black, reddish brown, silver or aluminum over the years. Others call it the Jackson Street Bridge, even though there’s no Jackson Street in Des Moines. It’s actually Jackson Avenue, a street name that popped up 10 years after the bridge opened. If you want to know more about how you can help, please click on the website and there, you can contact the people who can help you. The Chronicles will continue to keep you posted on the latest on the rehabilitation efforts of the bridge, which is about to start. Author’s Note: This bridge is part of the series on the Bridges of Copenhagen, which you can click here for a guide to the bridges worth visiting, even by bike. 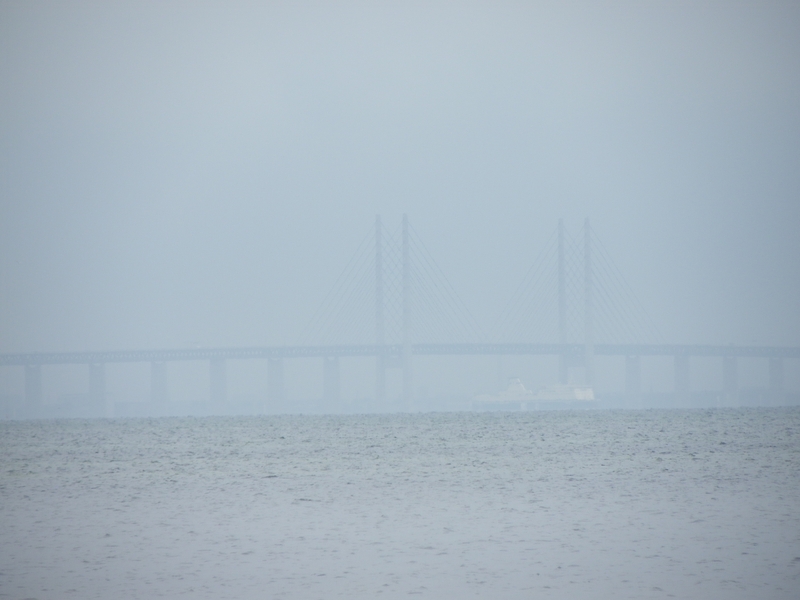 From an author’s perspective, crossing the bridge and seeing the view of the strait was like a Trans-Atlantic flight: it was nothing but water for the 10 minutes I went across. Yet going through the really tall, cable-stayed towers, lit up at night, brought forth awe in a way that so many people, who built the bridge, had risked their lives to accomplish not just a feat, but the feat. The feat was not only connecting Denmark and Sweden, nor was it connecting Europe from Scandanavia to the Mediterranean Sea. It was the ability to connect lands from hundreds of kilometers away. Since its opening in 1999, at least 40 crossings longer than this one have been added to a world map that has gotten smaller by the year. And while most of them have originated from China, more ambitious projects are surely in the works, including the Bering Strait crossing and possibly connecting North America with Europe over the Atlantic. 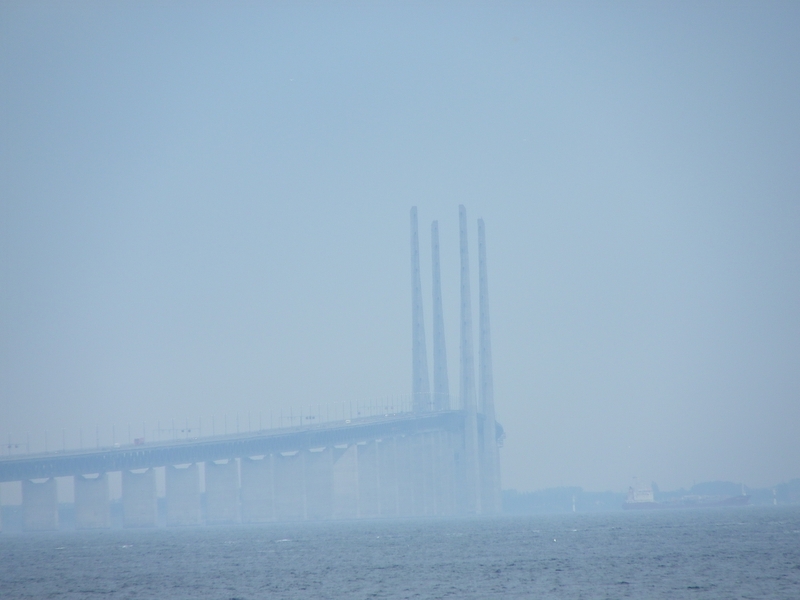 These may take a generation to complete, but the Øresund Bridge shows clearly that anything is possible as far as bridge construction is concerned.